What’s better than a wonderful walk that garnered thousands of people to celebrate fitness, friendship and a whole lot of fun?! Each year, the Skechers Pier to Pier Walk never fails to amaze everyone with its incredibly successful turnout for a good cause. This year’s exceptional event had everything from remarkable performances to awesome, celebrity meet-and-greet opportunities and of course, a great kickoff to a Sunday morning with a fantastic walk that helped support children with special needs and education. The 2017 Skechers Pier to Pier Walk took place on October 29, 2017 at the Manhattan Beach Pier. The extraordinary event brought an immense amount of joy to everyone and put the biggest smile on everyone’s face. Families and friends had an excellent time starting off their day in a stellar way. The atmosphere of the Skechers Pier to Pier Walk was unlike anything you have ever seen before. It was filled with tons and tons of people eagerly waiting to get going with their refreshing and enjoyable walk with the perfect view – Manhattan Beach. Everyone also loved getting to sport their favorite Skechers gear to the event. Many fan-favorite and phenomenal celebrities came out to show their support towards the terrific event. Boxing legend, Sugar Ray Leonard is an avid supporter of the Skechers Pier to Pier Walk and had a great time coming out to the event again this year. Fitness guru, Denise Austin brought extra excitement and a lot of energy at the event with her fun-loving and vibrant personality. As the queen of fitness and healthy living, Denise Austin certainly got everyone even more pumped for the fun walk they were about to embark on. In addition, Brooke Burke-Charvet, Aidan Miner, Jailen Bates, Thomas Kuc, Jason Drucker, Ava Kolker, Lexy Kolker, and Logan Shroyer attended the event, amongst many others. Brooke Burke shared her fun time at the event as seen in the photo below posted on her Instagram account. 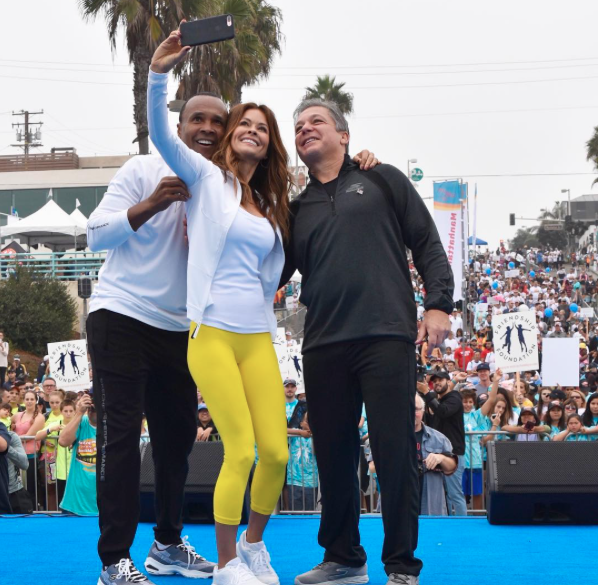 #SundaySelfie So honored to be part of such a powerful event in #manhattonbeach joining @skechers & almost 15k locals raising 💲for the public school system & #friendshipfoundation #P2Pwalk. The event started off with the National Anthem performed by Jada Facer. Then, dancing sensation, model and fashion icon, Larsen Thompson took the stage and left everyone in awe with her brilliant, dance routine. Larsen Thompson’s talent is unrivaled and with all of the hard-work and passion she puts into everything that she works on, she truly deserves all of her successes and the many more coming. Multi-threat: actress, singer, and dancer, Asia Monet Ray blew everyone away with her phenomenal performance of her hit, original song, “Come Along.” Asia Monet Ray defines what it is like to be multi-talented and she always slays all day, every day. Larsen Thompson gave fans a sneak peek look at her choreography for her performance as seen on her Instagram. The @skechersp2pwalk is THIS Sunday in Manhattan Beach🏃🏼‍♀️ @trinityinay @kaylashen and I will be performing with choreography by @karonlynntv so come join us in walking the 3.4 mile walk and help support schools & kids with special needs! ❤️ Register or donate online at http://bit.ly/1xqvMph !! Asia Monet Ray shared a clip from her performance as seen on her Instagram account below. Words can’t even begin to describe how much of a sensational event the Skechers Pier to Pier Walk is. It’s so amazing to see so many people show their support towards such a fantastic event and to see a host of celebrities use their platform for good and inspire others to take part in incredible events and causes like this one. The Skechers Pier to Pier Walk is one event you never want to miss – there is always some kind of special feeling in the air when this event comes around. I, Alexisjoyvipaccess had an exceptional time covering the Skechers Pier to Pier Walk again. Check out some VIPAccessEXCLUSIVE pictures from the event below and be sure to stay tuned for interviews with your favorite celebrities from the event on YouTube.com/alexisjoyvipaccess! Previous Article: Kelly Clarkson, Kelsea Ballerini, Why Don’t We And More Celebrate Helping And Leading Others At The Nickelodeon HALO Awards Airing 11/26! Next VIPAccessEXCLUSIVE: Aidan Miner Interview With Alexisjoyvipaccess At The Denim, Diamonds & Stars Event!